Settings to control this translator's behavior. Definition at line 22 of file BinaryToSource.h. Definition at line 47 of file BinaryToSource.h. 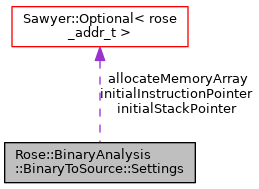 Trace the RISC operators for debugging. This causes diagnostic output to be emitted as the source code is being generated. Definition at line 25 of file BinaryToSource.h. Generate code that prints instructions. This causes the generated source to contain calls to printf so that each instruction is printed to standard error as it is executed. Definition at line 29 of file BinaryToSource.h. Optional initial value for the instruction pointer. Definition at line 32 of file BinaryToSource.h. Optional initial value for the stack pointer. Definition at line 35 of file BinaryToSource.h. Whether to allocate the global memory array. If this setting has no value (the default) then the global "mem" array is not allocated, but rather declared "extern". If the setting is zero, then the array is allocated to be just large enough to hold the maximum initialized memory address. Otherwise, the array is allocated to the specified size. Definition at line 41 of file BinaryToSource.h. Whether to zero the memory array, or just allocated with malloc. Definition at line 44 of file BinaryToSource.h.